Born from the Florentine tradition of "Cuoietto" leatherworking, this "Il Tacco" Coin Pouch is designed and made entirely in Florence by Master Craftsman Giuseppe Fanara, Il Bussetto Firenze , who has practised this craft for more than thirty years. Born from the Florentine tradition of cuoietto leatherworking, this Business Card or Credit Card Holder is designed and made entirely in Florence by Master Craftsman Giuseppe Fanara, who has practised this craft for more than thirty years. Il Bussetto Firenze since 1989. Born from the Florentine tradition of cuoietto leatherworking, this Eyeglass Case is designed and made entirely in Florence by Master Craftsman Giuseppe Fanara, who has practised this craft for more than thirty years. 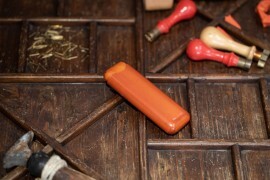 Born from the Florentine tradition of cuoietto leatherworking, this Cigar Case for Toscanello cigars is designed and made entirely in Florence this product is made entirely from cowhide that is tanned with vegetable extracts in Tuscany. Born from the Florentine tradition of cuoietto leatherworking, this Cigar Case for Robustus cigars is designed and made entirely in Florence by Master Craftsman Giuseppe Fanara, who has practised this craft for more than thirty years. Born from the Florentine tradition of cuoietto leatherworking, this Cigar Case for Toscano Havana cigars is designed and made entirely in Florence by Master Craftsman Giuseppe Fanara, who has practised this craft for more than thirty years. 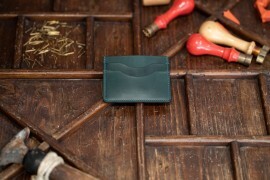 Credit card holder designed and Handmade in Florence, made in Italy. 100% Vegetable Tanned Leather , made in Tuscany. Four external card slots , one internal card slot. Measurements: 9.8 X 7.5 X 1 cm. Key chain designed and Handmade in Florence, made in Italy. 100% Vegetable Tanned Leather , made in Tuscany. Hand painted leather. Single key ring.Measurements : 8 X 3.2 X 0.5 cm. Key ring closed 4 keys 100% Vegetable Tanned Leather, made in Tuscany .Metal accessory made for four key holders. 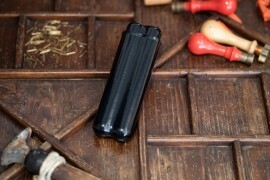 Measurements: 10.7 X 5.2 X 3 cm. 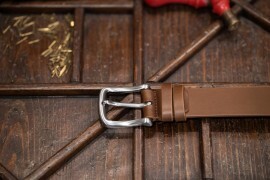 Leather Belt designed and Handmade in Florence, made in Italy 100% Vegetable Tanned Leather , made in Tuscany .A single piece of “Cuoio “ Leather. Solid Brass buckles , 100% made in Italy. Measurements : 2 cm , 3 cm , 3.5 cm, 4 cm. Passport holder designed and Handmade in Florence, made in Italy. 100% Vegetable Tanned Leather , made in Tuscany. Made for travel , documents, passport. Eight card slots two internal slots (9.5 X 13.5 cm). Measurements: open 22 X 14 X 1.5 cm. close 11 X 14 X 1.5 cm. 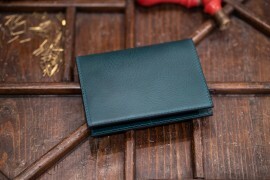 Bifold Wallet designed and Handmade in Florence, made in Italy. 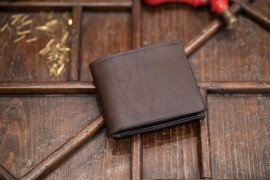 100% Vegetable Tanned Leather , made in Tuscany.Six card slots , two internal card slots. One bill compartment. Measurements : closed 9.8 X 7.5 X 1.5 cm .